Next to shonen action series, I really love manga with comedic elements veering into parody. In a world of media trying to go darkly serious at every turn, I do love a good laugh. 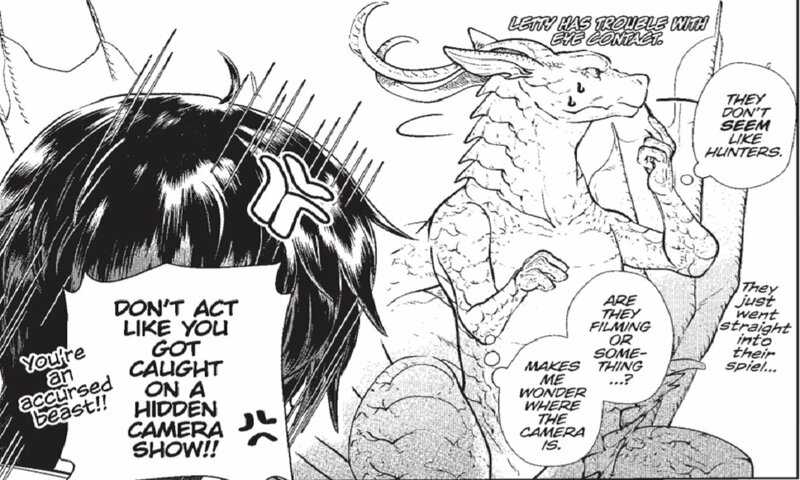 It’s with this mindset that I absolutely adored the first volume of Dragon Goes House-Hunting, a fantasy-comedy manga with a hilarious premise. Dragon Goes House-Hunting begins with our protagonist Letty, a bumbling dragon that lounges at home and is somewhat irresponsible. After one too many mishaps, he gets exiled from his residence and is forced to find a place of his own; down on his luck, he finds out that humans, known as Yuusha here, want to kill him in order to get some tasty loot. After a run-in with a group of these people, Letty is saved by the mysterious elf Dearia, who is well-versed in spells, architecture, and real estate. Dearia also has a host of connections with creatures and monsters of the land, and he uses this to help stake out leads for Letty. Together, the duo tries to find a proper dwelling for the cowardly dragon while defending themselves from oncoming attacks from all over the place. Perhaps the biggest thing to note is how absurd the whole plot is. From smartphone game references to JRPG tropes, the whole series is a wild romp that never takes itself seriously (most of the time). While there are indications that Dearia has a history with dragons, everything else is interpreted rather humorously. One example would be the traveling humans who want to kill Letty as well as infiltrate dungeons; they’re initially a threat, but once Dearia all but murders them in his first appearance, they appear to be bumbling recurring characters who can’t catch a break. You’re rooting for the bad guys, but only because their goal is not malicious in the slightest. As a parody of fantasy series, the volume has an art style to match this, and looks great during action scenes. This further highlights the comedic timing of the series, as these tense scenes are usually followed by a humorous quip by one of the characters. Dragon Goes House-Hunting doesn’t expect you to take the serious aspects at face value, and it shows. What is normally scary and dreadful is actually comical (though not harmless, as Letty experiences firsthand). A castle filled with traps is portrayed as a minor inconvenience for the dragon thanks to his sturdiness and girth, while a horde of undead can throw a great party. In fact, the biggest flaw is the main protagonist himself; while we’re supposed to feel sorry for Letty, his antics and laziness feel like a detriment rather than a sympathetic point. It’s hinted that he might not even be a dragon, as he can’t fly and his other abilities are rather mediocre. This does set him apart from the usual big bad dragon of which the human characters perceive and fear, but it comes across as pathetic rather than relatable. On the bright side, he isn’t insufferable, knowing that his skillset is limited and wanting to retreat rather than picking a fight with the characters around him. Dearia, on the other hand, is a likeable character from the start; while he veers into Mary Sue territory at times, his calm yet hardworking demeanor and genuine desire to help Letty make him a great foil to the naivete of the dragon. While it does seem like the friendship is one-sided (with Dearia doing almost everything in terms of finding a house), it’s a dynamic that works well here. Perhaps the oddest part of this first volume is that, while a pretty fun look into the real estate of mythical creatures, it’s a premise that I feel might lose gas a few volumes in. The episodic structure of Letty trying to find a house each chapter is hilarious the first few times, but if the series is going to succeed later, it’ll have to try and subvert this formula and delve into the colorful supporting cast of human and non-human creatures. This is shown in brief spurts as gags, so I think that’s a direction the series should head into once the formula starts to get stale. Volume 1 of Dragon Goes House-Hunting is a delightfully humorous glance at how mythical characters can buy real estate. Its surprisingly comedic world is rife with parody and some heartwarming fun for those who want a little fun with their fantasy.